The music of war, peace, and the joy of Christmas! 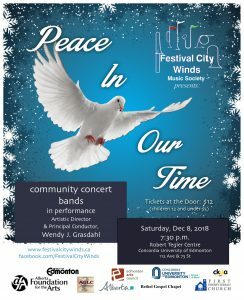 The Festival City Winds and director Wendy Grasdahl invite you to meditate and hope for Peace In Our Time and escape the various tragedies taking place throughout the world through music–a respite and break from all of the hectic headlines with some holiday favourites, and some quiet, meditative music. Reception following. FREE ADMISSION with your Concordia ID at the door; tickets are $12 Adults, $5 Children 12 and under, and can be purchased at the door. 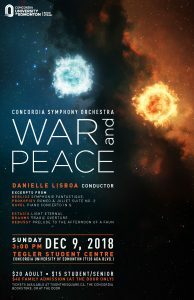 An eclectic selection of contrasting repertoire explores the yin and yang in Concordia Symphony Orchestra’s “War & Peace,” from the bombastic energy of Berlioz’s Symphonie fantastique to John Estacio’s ethereal Light Eternal. Other classic extremes include Brahms’ Tragic Overture and Debussy’s prelude to The Afternoon of a Faun, and excerpts from Prokofiev’s Romeo and Juliet and Ravel’s Piano Concerto in G. Dir. 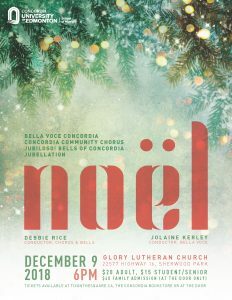 FREE ticket for Concordia faculty, students, & staff, available from Jennifer at A306. Otherwise, tickets are $20 Adults, $15 Students and Seniors, available from Tix on the Square (780.420.1757), Concordia’s Bookstore, or at the door. Special Family Admission: $40 (available at the door only). The vibrant, timeless tidings of the gospel story are celebrated in festive fashion! 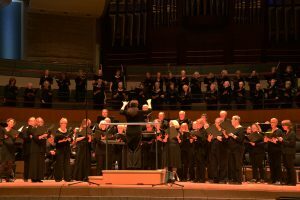 Concordia’s student/community choirs and handbell ensembles join in words and tunes ancient and contemporary, capturing anew the wonder, reverence, and joy of the first Christmas. Reception following.